I use Gmail for my private email account. It does have advertising, but it’s discreet and, to be honest, I don’t usually notice it. They attempt to make the ads relevant to what’s on the screen, but occasionally it goes wrong. I was clearing out some spam today and noticed at the top of the page a link for FRENCH FRY SPAM CASSEROLE. This had to be checked out! Method: Mix together and bake. Frankly I’d rather starve to death than eat that! 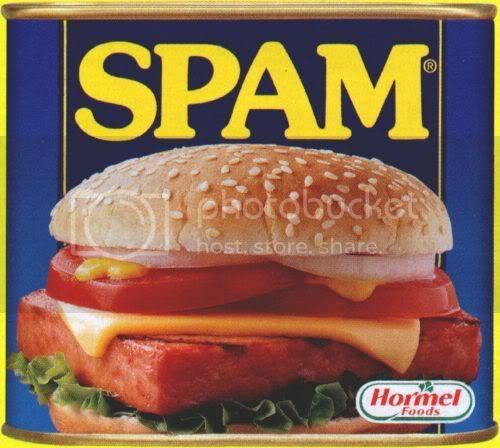 Fortunately Spam, cheese and condensed cream of chicken soup are out of stock down the local supermarket!
. This entry was posted on Wednesday, July 12th, 2006 at 7:13 pm	and is filed under Food and Drink, Humour, Stupidity. You can follow any responses to this entry through the RSS 2.0 feed. Both comments and pings are currently closed.